Home » FAQ » How to calculate Weight tolerance of a molded part? We understand that with plastic parts, weight is the best method of controlling the process capability. Is there a guideline or standard for defining the tolerance? Shot to shot weight variation calculated as (three standard deviations) divided by (average weight) must be less than 1% and should be less than 0,5%. 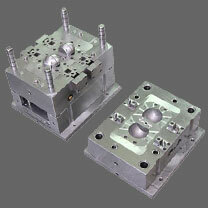 In general it is possible to achieve 0,1-0,4% weight variation using scientific molding. To calculate a comparable capability (Performance) use (1% of average weight) divided by (3 standard dev.). It is absolutely true that weight and dimensions do not correlate. Unless the process is reasonably robust and the dimensions are correct at the start, then weight will tell if the process is shifting (use SPC). But still it will not guarantee dimensions are unchanged. Anyway weight variation can tell if the process is all right at all to begin with. Too much variation indicates a poor process that is sensitive to changes. The cavity imbalance should be less than 5% when making short shots (no hold pressure) unless it is small parts (less than a couple of grams), then as much as 25% could be acceptable and still produce parts with the same dimensions. It should in any case be investigated if there are cavity differences in dimensions. How much is "variable"? If weight part to part is truly critical as it could be in some applications (example - assembled items that must "float" at some constant level in "water"), the information above is all critical and don't forget also that the specific gravity of each lot of material could show some variability - work with your vendor to be sure that an acceptable range (made from standardized materials that have known and repeatable values) is knowable, known, and repeatable. Just as an example, the fillers in some materials can cause a fairly wide range of SG and all be "the same". If the variability has to be tightened even further, it might be of value to design a "removal area" into the part, insert each part into a tool to remove all "upside" material down to the intended acceptable range and reclaim the regrind.